Kent County Council is one of the most diverse councils in the UK, employing over 44,000 people. The council provides a wide range of services including; maintaining roads and highways; processing and recycling half a million tons of rubbish each year; educating 200,000 children; running libraries; providing adult education; and providing youth and community services. With such a diverse range of services being provided by staff based at over 500 buildings across the county, the council relies heavily on its IT systems to keep services running smoothly. As part of the council-wide recognition that its customers are different, and so need different services, the IT service desk is committed to providing staff with the most appropriate IT services to support them in doing their jobs. Driven by this focus on service, the council carried out a detailed selection process to procure new service management software in 2008. The process included an evaluation of solutions from LANdesk, BMC Remedy and Hornbill, and the delivery of a proof of concept system. 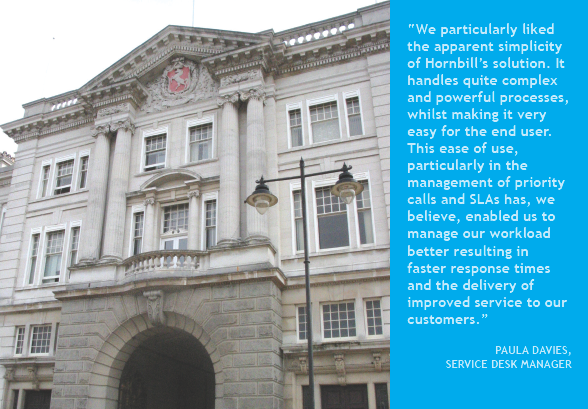 Hornbill’s Supportworks ITSM Enterprise was the preferred choice as it met many of the Council’s functional requirements out-of-the-box and was the most user friendly solution. Supportworks ITSM Enterprise is used by 150 ICT operations staff to support 10,000 council staff. The first phase of the implementation provided Incident management and request fulfilment for the service desk. To support the council’s transition from a focus on technology to a focus on Service, a SelfService portal was also deployed to all staff via the council’s intranet. This allowed staff to check the status of their incidents and service requests, which reduced calls to the service desk, improved customer satisfaction ratings and resulted in immediate savings equivalent to a full time member of staff on the central service desk. In the second phase of the implementation, Problem and Change Management were integrated within Supportworks. A dedicated Service Management Team was created incorporating, Problem, Change, Major Incident Management and MI reporting. A customised SelfService portal was also added for the Libraries division. Having SelfService for highly specialised applications in the different directorates ensures that requests for service can be tailored according to the needs of the customer and routed directly to specialist teams for fulfilment, while remaining visible to the service desk as a whole. The Service Management Team has engaged with other directorates with a view to rolling out similarly customised services. Supportworks ITSM Enterprise is supplied with a range of standard reports and it is also easy for users to design their own reports. This has empowered team leaders to draw down their own reports to manage their individual areas. Now 2nd and 3rd line support teams are better able to manage their workload, which has resulted in faster resolution times and better performance against Service Level Agreements (SLAs) across the entire service desk. One of the most recent initiatives empowered by Supportworks is a process to monitor all calls logged for new starters to identify training requirements. Since implementing Supportworks the service provided to customers has improved measurably. The call abandonment rate is now running at an average of 5%, down from 17% in 2007/2008 (a reduction of 70%). The volume of calls taken and number of calls resolved at first contact have both increased significantly. Around 80% of calls are now resolved within one working day, largely due to more efficient working practices and use of Supportworks. The reports also show that the average wait time for a call to be answered is down from 1.3 minutes to 19 seconds (a reduction of over 75%). This has been a significant factor in driving up customer satisfaction ratings. To drive service improvement, the IT team uses a feedback feature provided within Supportworks, enabling customers to rate the service they have received. When the call is closed the customer receives an email with an invitation to rate the service and a link to the specific call. This feature has encouraged customers to provide feedback, enabling the service desk to monitor performance of both individuals and teams to determine how service can be improved. As part of its council-wide on-going commitment to Service Excellence, the service desk team undertook Service Desk Institute (SDI) certification. An initial audit was performed by the SDI in 2009 resulting in a list of recommendations for areas that needed improvement which the project team turned into an action plan. Members of the project team met up every two weeks to review the action plan and ensure that they stayed on target. The team also communicated regularly with staff so that they could be included in the process. When SDI returned for a full four day audit in April 2010, Kent was awarded a four star accreditation, which is the highest level attainable at the first attempt.